Polonia Ladies win the League! 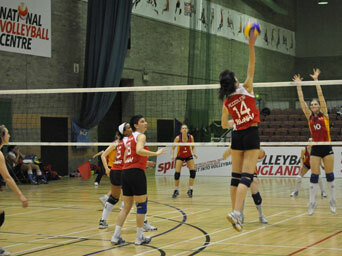 Polonia IMKA London were back in action on the second day of the Super 8s playoffs on Sunday 3rd April in Kettering. Having breezed through the first day of the playoffs by beating both Malory and University of Birmingham in straight sets, the girls were ready to face Birmingham again and their nemesis Swiss Cottage, the only team in the league that had managed to beat Polonia this season, with that win coming in the last regular season game of the season. This was an unexpected loss for the Polonia side and they were geared up for a rematch. The first game was against Swiss Cottage. However the game didn’t start very well for Polonia. The initial score of 12-3 in favour of Swiss Cottage didn’t bode well for Polonia however they managed to wake up towards the end of the set and reach set point in their favour at 25-24, only to eventually lose the set 25-27. The team couldn’t keep their composure and were struggling with service reception, resulting in poor setting and attacking. Swiss Cottage found some great rhythm and blocked very effectively during that set. 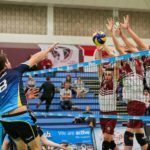 This was a wake up call for Polonia who didn’t want a repeat of the only defeat of the season and they started to fight back straight away in the second set. The second set saw a great performance from Polonia who were back en form with excellent receiving, resulting in good distribution and efficient attacking leading to a 2nd set victory by a scoreline of 25-12. The third set was a very close affair, with both teams fighting point for point, only for Polonia to eventually close out the set at 28-26 after some spectacular rallies. In the fourth and final set, despite some more good blocking by Swiss, Polonia kept the lead and managed to stay cool all along to win the game 3-1. After a good rest and having watched the Polonia men win against top of the league Sheffield, Polonia IMKA London were back on court, this time against University of Birmingham, whom they had beaten 3-0 on the first day of the playoffs. The play was consistent on both sides and the score reflected it in two of the three sets, each team fighting point for point for the win. Coach Mark Kontopoulos used his full squad and changed his rotation to give players court time and rest some of his starting players, yet the game still ended with a fairly comfortable victory for Polonia. This last win of the day confirmed the team as League Champions for the first time in Club history and players and coaching staff were all extremely happy to have achieved the first goal of the season with two games to spare in the Super 8s. The team hopes to repeat the same result next Sunday 10th April back in Kettering on the final playoff day. This will be good preparation ahead of the VE National Cup Final taking place in Kettering on Saturday 16th April at 15.00. Polonia Men are Champions of England!